Wow. What an awesome book this turned out to be. I borrowed it from the library and have already put the next two books on hold. 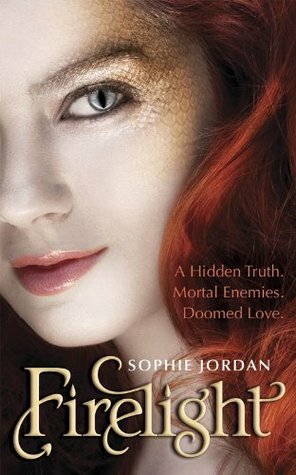 Jacinda is a draki, a descendant of dragons who can become human. She's also a rarity--a fire-breather--and so her pride pretty much wants to control her every move so she can pass the gift on. But she's rebellious and loves to fly, so when she sneaks out with her best friend and they're spotted by hunters, she hides. One of the hunters finds her but doesn't tell. She can't believe her luck, but her adventure forces her mother to get her and her twin sister out of there in the middle of the night...or Jacinda's punishment will ruin her draki. Not that moving to the desert helps. Here, her draki suffers and will eventually die. Trying to fit into the human world is torture. Until she runs into a boy called Will, who happens to be the hunter who protected her in the cave. Something about him draws Jacinda as much as the draki always lurking beneath her skin. I loved this story! The mythology of the draki and hunters was fascinating. I enjoyed watching Jacinda grow as both a human and draki, while trying to fight her attraction to Will. I also felt sorry for her because her mother and twin sister continually alienate her because of what she is. Poor Jacinda. Such a great story, but the way things ended... what's gonna happen next? Can't wait to find out.